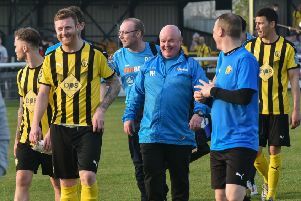 Leamington boss Paul Holleran declared himself happy with his side’s start to their friendly campaign after two wins from two for his newly promoted side. A host of new faces were on show in the 7-0 success at Daventry Town and the 3-1 victory at home to Worcester City and Holleran said both games served their purpose irrespective of the results. “It’s the start of the process,” said Holleran. “We got people back on the pitch and gave them game-time. “I thought we’d get a lot of ball in the first two games and that’s what we wanted. “We got people on the ball and players were able to learn each others strengths and weaknesses. “Friday night [at home to a Leicester City XI)] will be different in that they’ll have a decent amount of the ball. One player who has not featured, however, is the luckless Dan Quigley whose move to Brakes now appears in doubt after a double blow for the former King’s Lynn midfielder. Quigley broke his wrist in play-off final action for Rushden & Diamonds in April and, after having the cast removed, discovered the break would need to be reset, resulting in another four to six weeks on the sidelines. On top of that, the 27-year-old’s appendix burst and Holleran does not expect the combative midfielder to be fit to return to action until the start of August at the earliest. “We’re holding off with that one at the moment. Brakes follow up tonight’s home clash with the Foxes with a short trip to Townsend Meadow on Tuesday night to take on Racing Club Warwick.